It was love at first sight, you see? She was beautiful and responsible, and he would do anything for her. Jacob’s love for Rachel was more than infatuation or lust – it was devotion. Not only was this a woman he was willing to work seven years to have the honor of calling his wife, he set the worth of Rachel himself by being the one to suggest to her father, Laban, such a long span of time in order to take her to him for a bride! In ancient cultures, it was proper for the family of the bride to give the groom a dowry to receive the woman as a wife. It is an incredible show of the surety of Rachel’s worth and value in the eyes of Jacob for him to suggest that seven years of his time and effort could gain Laban’s daughter. If that is not a show of true love, what is? At the end of this period, he took Rachel as his wife, but not before being tricked by Laban into first marrying her older sister, Leah. This event, although a sure surprise, still left him undeterred to have the one who already had his heart; Laban thus gave him also Rachel after only a week’s marriage to Leah, provided he agree to serve his father-in-law for another seven years (see Genesis 29:27). Although he was a devoted husband to both sisters, his love for Rachel never diminished. Leah provided him easily with sons, and yet Rachel was barren for a considerable time after their union was sealed. At last, after several years, she conceived and birthed a son for him, whom she named Joseph. As the years passed, he treasured Joseph above all the sons obtained from Leah, her handmaid, as well as the sons obtained from Rachel’s handmaid. Joseph was the son of his beloved bride, and he cherished him as the fruit of their love. After the passing of several more years, Rachel conceived a second time. 35:16 And Ya’aqov pulled up from Beyth Eyl, and there was yet a length of land to come [to] Ef’rathah. And Rakheyl birthed, and her birthing was fierce. 35:18 And it was in the going forth of her soul – for she died – that she called his name Ben Oni, but his father called him Binyamin. 35:19 And Rakheyl died, and she was buried on the way to Ef’rathah, which is Beyth Lakhem. At what should have been the most joyous time of their life, this tragic event darkened the future for Jacob and his family. The love of his life – Rachel – succumbed to the difficult birth of her second son. She lived long enough to name him after his arrival. 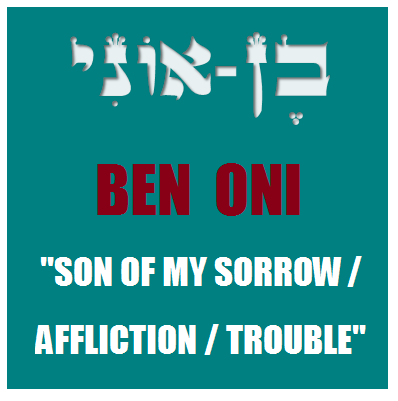 The name she gave to him was Benoni, which, in Hebrew is BEN ONI, and means “Son of My Emptiness.” This name reflected the trouble and sorrow she experienced in bringing him into this world. For Rachel, knowing the severity of this birth, she understood that she would not survive, and so named him from that perspective of her mortality. Yes, he would be her son, but to her, it was in vain that he would be such, for she would not live to experience this new arrival and the blessing of being a mother for a second time. Truly, in so many respects of the facets of the name’s meaning, he was Benoni…. Jacob could not suffer to call his son by this name. Rachel was yet alive when he heard this, and such a name for a son of Rachel his beloved would not be allowed. He gave his final son the new name of Benjamin, instead of Benoni. 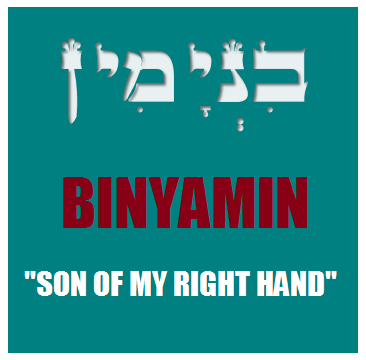 The Hebrew name literally is pronounced as BINYAMIN – “Son of My Right Hand.” From the viewpoint of the text itself, Jacob apparently changed his name while she was yet alive. Names are changed several times throughout the historical account of the Word, so this incident should be of no real significance at first glance, except for the mournful circumstances surrounding it. 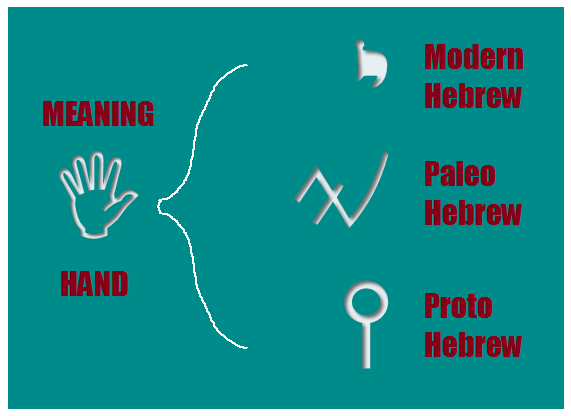 However, this instance of a name change is especially notable in the text of the Word, and it is so only because of a prior reality preserved for us in the text of the Torah. The detail that makes this instance of Jacob changing the name of a son significant is that, for the other eleven sons and one daughter of Jacob, his wives named every one, and he never objected nor chimed in that he might want a different name! That’s right – all of Jacob’s children were named by either Leah or Rachel (even the sons of their handmaids were named by one of the two wives) – and only in the case of Benjamin did Jacob change the name! Thus we see that Jacob renamed his last child. He would not be Benoni (Son of My Emptiness), because Jacob’s life was full of love for his bride, Rachel. He could not bear to memorialize her with such a name. Their love was real and meaningful, and it carried Jacob through fourteen years of hard labor under Laban. He chose instead a name that would remind him of the woman at his side. He chose a name that would recall her positive presence in his life. He chose BINYAMIN (Son of My Right Hand) to serve as a memorial for the adored wife he lost too soon. She stood by his side, his right hand, his better half. Rachel was his right hand, and Benjamin’s name, in Hebrew, pointed to this reality in Jacob’s life. Interestingly, Rachel’s name means in Hebrew “Female Sheep,” that is, “Ewe.” It is of no coincidence that the Messiah spoke of the favored of the Holy One as “sheep” that are on His right, in Matthew 25:33. And He shall place the sheep from His right hand, and the goats from His left hand. The name BINYAMIN is a memorial to his lost Rachel in another heartbreakingly beautiful manner as well. In the Hebrew text of the passage about the birth of Benjamin, there is a detail that points to Jacob and Rachel and their union as father and mother of the newborn son. 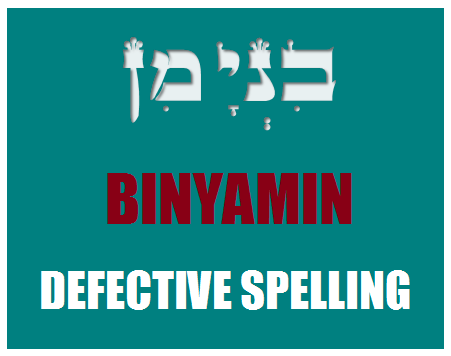 The name BINYAMIN is spelled in Hebrew with two letter YODs in Genesis 35:18. This particular letter in Hebrew is anciently depicted as an outstretched arm and hand, and even the Hebrew term YAD itself means “hand.” Therefore, while Rachel still lived for the short time after the birth of her second son, Jacob displayed his desire and hopes for her survival by renaming his son BINYAMIN, and depicted in that name are two hands (Jacob and Rachel) – a symbolic portrait of their united presence in the life of the infant. Jacob hoped for her healing and restoration even at such a late and grim place in her life, and expressed it by altering the name of his son as a memorial for how much he valued the bride of his youth, and included in this memorial a manner of spelling that reflected his hope for her involvement in the life of Benjamin. Of course, we know that she did succumb to the severity of her labor, and he lost his cherished bride and the mother of his two most-loved sons. The grief of Jacob was real. He mourned for Rachel as a man deeply in love would be expected to do: in his own private way. Beyond the construction of a column to serve as a monument marking her burial place, Scripture does not openly discuss his method or period of mourning. As beloved and as important as Rachel was in the life of Jacob, she passes from the narrative at this point, and the reader is quickly moved to the next phase of events in the life of our patriarch. The Hebrew text, however, inspired by the mind of the Spirit, preserves a subtle hint throughout the rest of the account of Jacob’s life that hearkens back to Rachel and the hope and grief he possessed for his lost love. That hint lay with Benjamin. Benjamin is mentioned a second time, only a few sentences after the death of Rachel and the setting up of the burial marker by Jacob. In the same chapter, in Genesis 35:24, it lists the sons of Rachel while giving a list of the sons of Jacob and his wives. The sons of Rakheyl: Yoseyf and Binyamin. The spelling of Benjamin’s name here is subtly different in the Hebrew text of the Torah. This time – the first time he is mentioned after the distinct death of his mother – Benjamin’s name is altered once more. In this instance, with his mother gone, his name is missing one of the letter YODs! Although this is known as KHASER spelling in Hebrew (defective spelling), this is actually a commentary of the Spirit on the grief of Jacob. He lost Rachel his bride, and she no longer participated in the life of the son they had together. This version of Benjamin’s name is a touching record of his sorrow and the gaping hole her passing left in his life. Preserved in the very spelling of the name of Benjamin in this instance is a glimpse into the heartbroken soul of Jacob over Rachel. This unique new spelling of Benjamin’s name is of note also in that every other time the Hebrew word for “right” / “right hand” is used in the Genesis account of the life of Jacob, it is spelled correctly with two letter YODs – YAMIN. Only in the name of Benjamin does this spelling alteration of “right hand” happen in Jacob’s account. The Holy One was careful to preserve a detail of how a patriarch was affected by the loss of a woman who was integral to his life, and who was responsible for bringing into this world men who would serve as vital instruments in the history of the people of Israel. Benjamin’s name is used thirteen more times after this instance in the account of Jacob’s life in the book of Genesis. The way his name is spelled alternates back and forth at times, between containing two YODs and only one YOD. On the surface, there seems to be no rhyme or reason, for sometimes it is spelled the same again and again from one chapter to another, while at other times, it may be spelled one way in one verse, and the other in the very next verse. It is only when looking mindfully at the context of the passage in which it is found does this seemingly random spelling change take on deep and moving meaning. In instances of fear and worry, we find the name spelled without the second YOD, while in instances of hope and joy, the name is spelled wholly. One can envision the heart of Jacob in these moments by this alternating spelling – at times burdened by the loss of his bride, and at other times, recalling the hope he had for restoration and blessing while she still yet clung to this life. I leave it to the reader to look into the Hebrew text at all the in-between instances of this careful spelling of Benjamin’s name in the story of Jacob, and let the Spirit lead you to see the touching moments of memorials of loss and hope that are reflected in Jacob’s heart by the inclusion and omission of just one simple Hebrew letter. And Ya’aqov ended commanding his sons, and he gathered his feet upon the bed, and exhaled, and was gathered to his people. The Spirit uses the presence or the absence of one simple Hebrew letter to convey the loss and the hope we can have in this life. Those we love can be taken from us, and we may never be the same, but at the same time, there is the hope that what they were lives on, and one day, in the depths of His mercy alone, there will be a reunion, when He so sees fit to grant it to us.